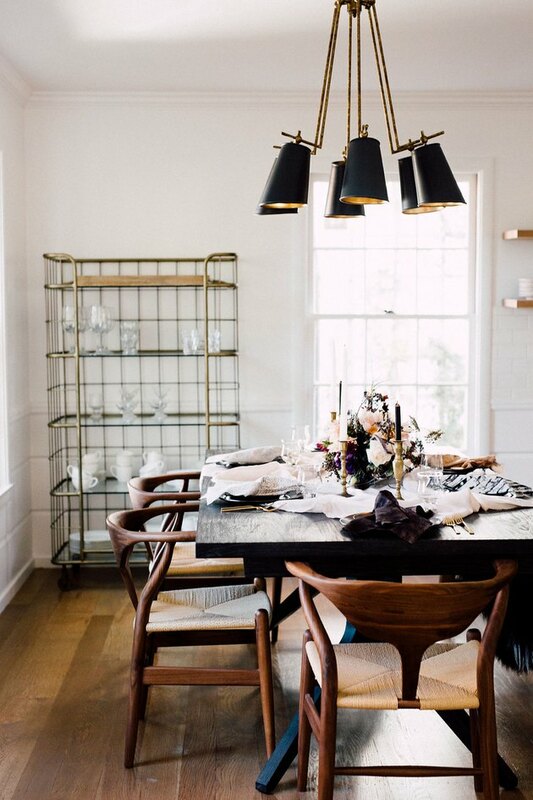 Want to give your dining room a contemporary refresh? Bringing your space into the present is easier than you may think. The key ingredients for nailing this timely aesthetic are open layouts, well-made furniture, utilization of technology, and eclectic accents. If this sounds ever-changing, that's because it is. Seeing is believing. Scroll on for 13 contemporary dining room ideas that will inspire your next design makeover. Overly curated spaces are out. The trick is to mix and match. Instead of sticking with six or eight of the same chairs, toss in a bench for communal seating. 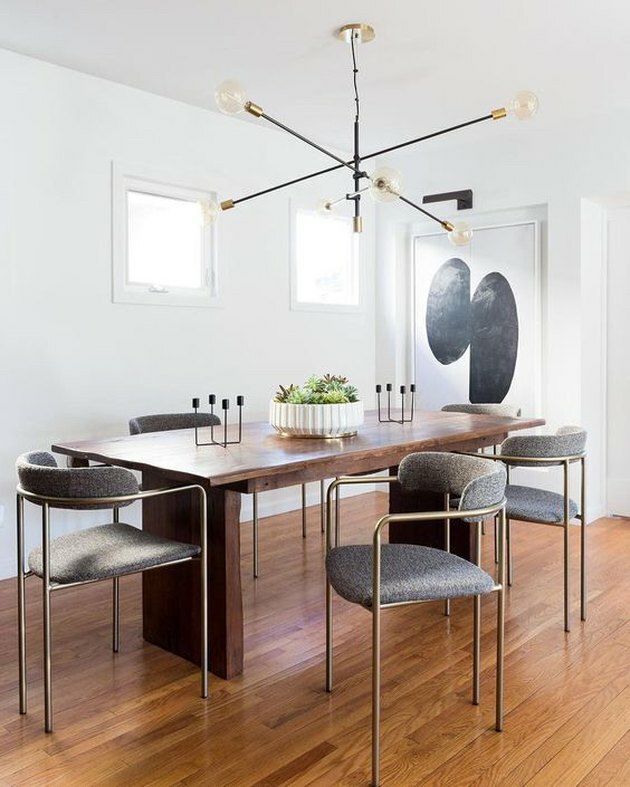 An industrial bistro globe chandelier plus oversize artwork and sleek dining table round out this redux from Arent & Pyke. 2. Bring in organic elements. These days, many homeowners are taking a more minimal approach to home decor with an emphasis on nature. To that end, Alicia from Cheetah Is The New Black utilizes organic elements — such as fresh blooms, gauzy textiles, a sheepskin throw, and wood — to elevate the aesthetic in her dining room. 3. Find a fabulous chandelier. 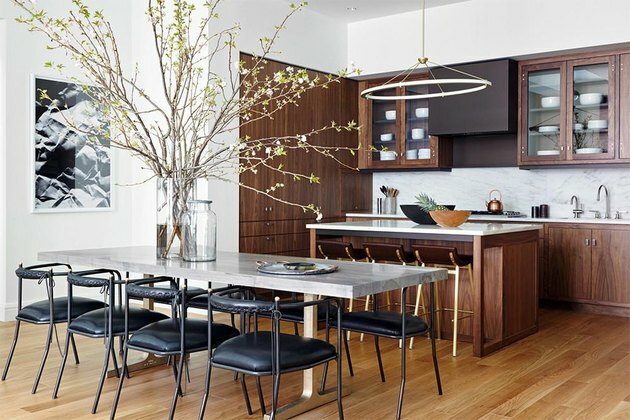 The vibe in this Gramercy Park triplex designed by Sheep and Stone is glamorous and creative. 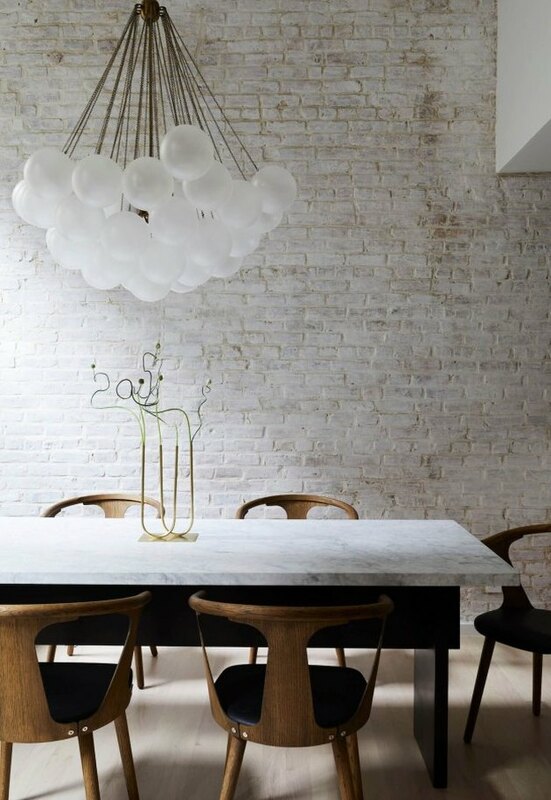 A stunning chandelier (which certainly qualifies as an art piece in its own right) and delicate yet sculptural foliage play well with the whitewashed brick wall backdrop. 4. Or, opt for multiple fixtures. If you're looking for a jaw-dropping contemporary dining room idea, look no further than this space designed by Raili Clasen. 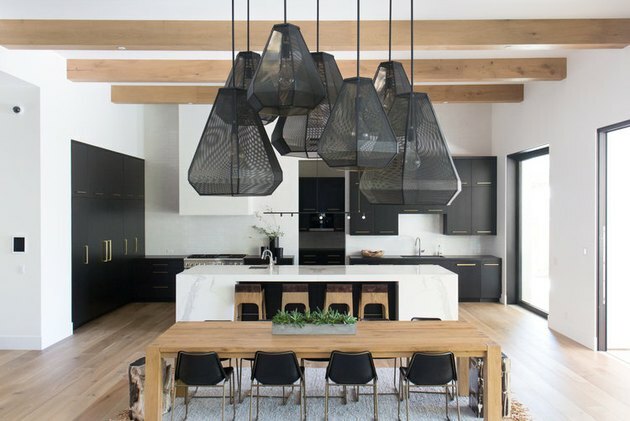 The artfully arranged grouping of custom pendants is undeniable proof. The scale and juxtaposition against the white walls and light wood make a major impact in this setup. From shiplap walls to nautical-inspired lighting to clean-lined furnishings, this space designed by Amber Lewis is cool and contemporary. Meanwhile, the neon hued artwork injects playfulness. This Tribeca dwelling designed by Tamara Magel is the epitome of a contemporary dream home. 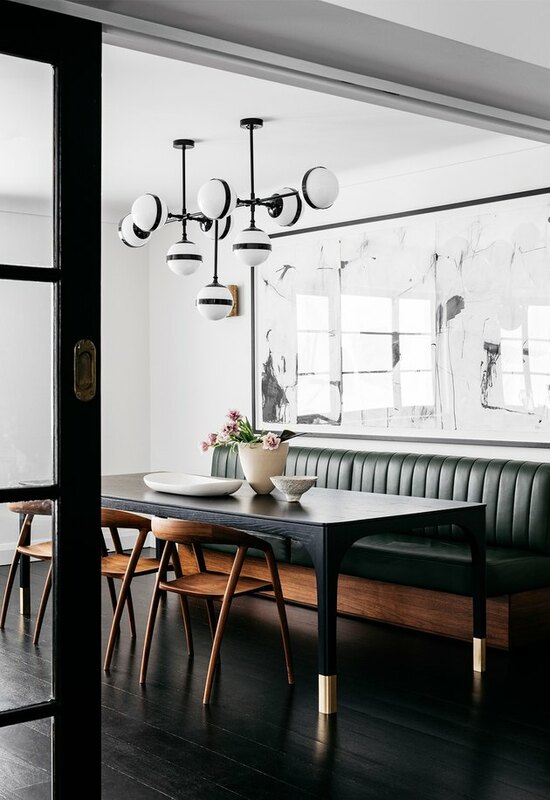 White walls allow the breathtaking views and the sleek design to take center stage in this dining room, while black window frames, dark wood finishes, and brass accents instill a sense of luxurious glamour. 7. Keep it low key. 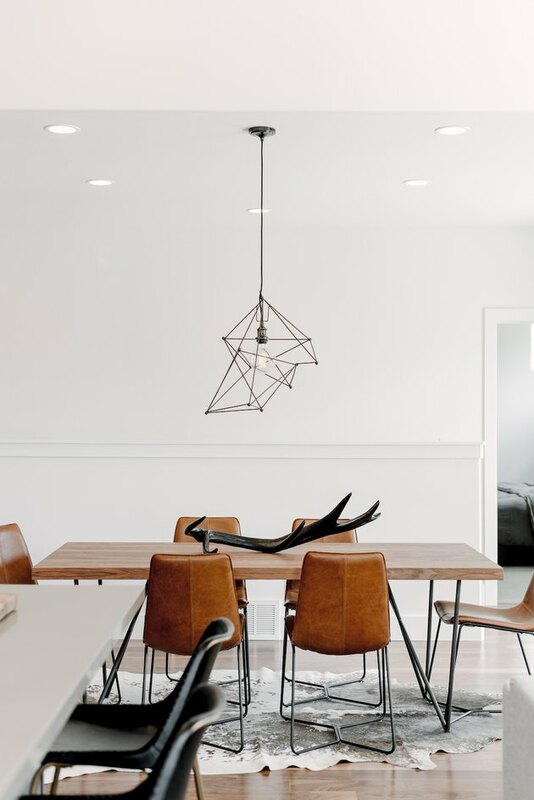 Designed by Mikelle Mabey, this low-key Utah dining area is impeccably styled though not overly precious. The key to setting the tone in this bright and airy meets industrial space is a mixture of clean lines and natural textures, then layering in artwork, lighting, and other personal touches. It's no secret that we love a good focal point. In this Tribeca bachelor pad designed by Consort, warm walnut millwork and dark finishes reinforce the contemporary masculine sensibility. Unexpected elements — such as oversize tree branches displayed in a vase — feel super fresh and draw attention to the gorgeous BDDW dining table. 9. Embrace white and wood. The combination of white and light wood is quickly becoming a "classic." And it makes total sense. 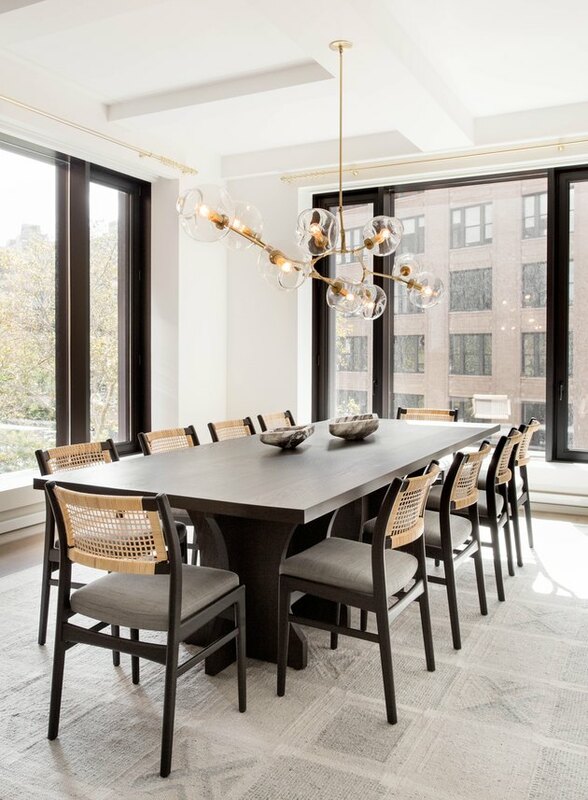 The pairing is crisp and oh-so-grammable, yet still retains a bit of earthiness that plays well in contemporary digs like this West Village dining room designed by Sheep and Stone. We love the fringe wall hanging, too. 10. Don’t shy away from eclecticism. Coley Arnold, co-owner of Junk In The Trunk Vintage Market, proves that natural materials and eclectic accents are also hallmarks of contemporary design. 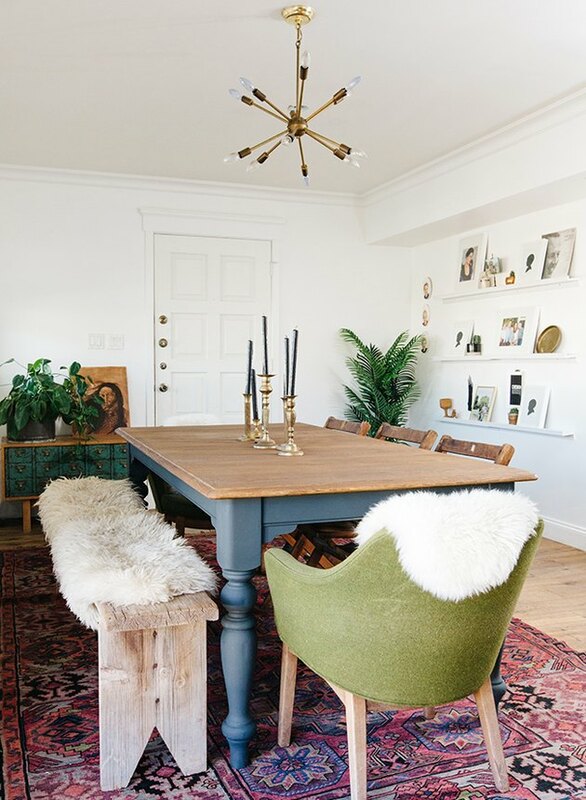 A rustic bench, an antique buffet handed down from her parents, a patterned area rug, and lots of vintage treasures come together in her dazzling dining room. 11. Don’t be afraid of black. 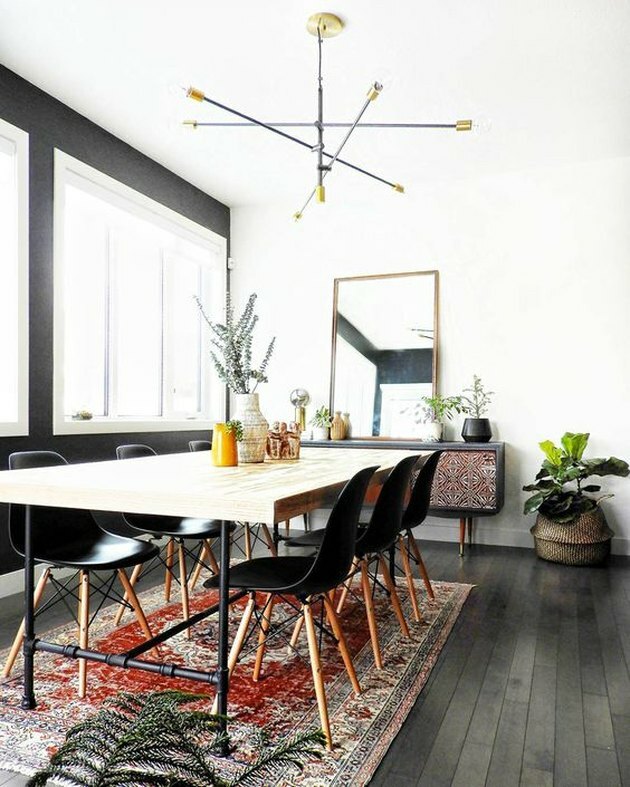 We've seen a lot of swoon-worthy white spaces so far, but there are tons of reasons why you should consider a black dining room. This example from Crave Interiors marries midcentury furnishings and an on-trend kilim rug. 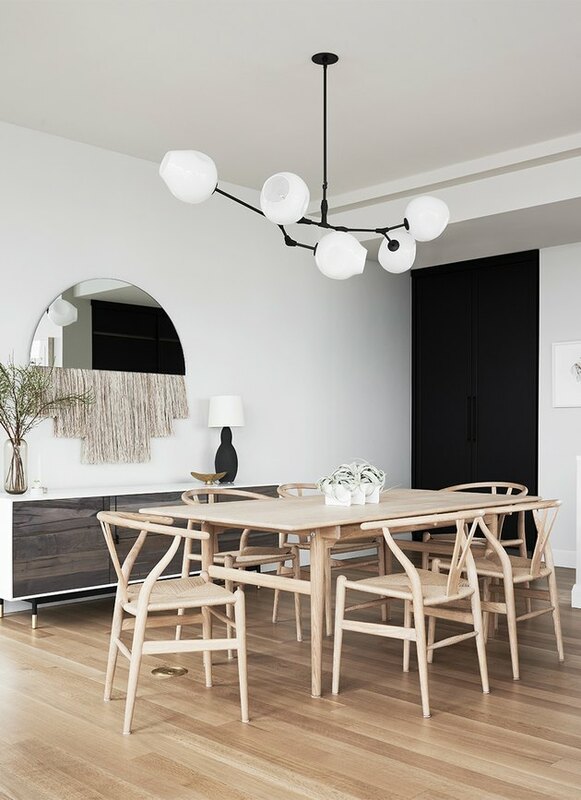 This feminine dining room designed by Decus Interiors stands out from the crowd. The simplified furnishings and the subdued color palette — made up of white walls, dark wood, and ash rose accents — allow the bold artwork to be the focus, followed by the dreamy caned chairs, of course. When minimalism is the goal, every piece matters. 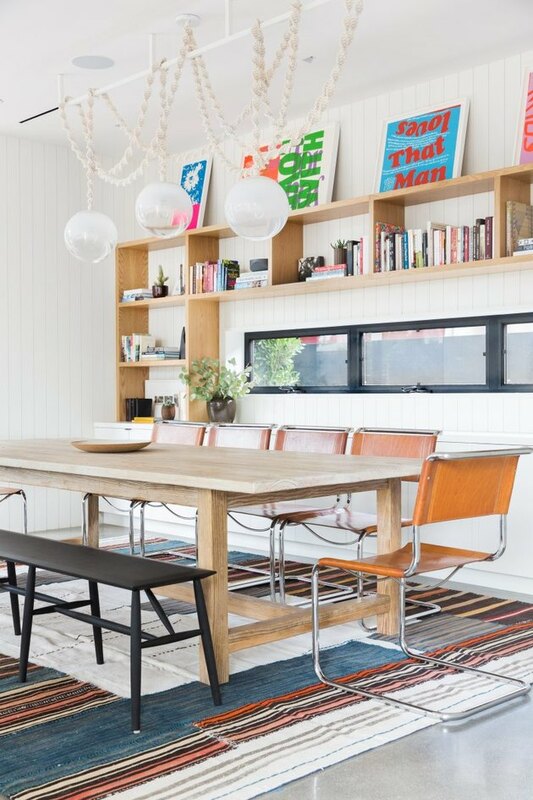 An abundance of wood counterbalances the white walls in this Santa Monica dining room designed by Jenn Feldman. Carefully selected accessories — such as the midcentury chandelier and the large abstract print — punch up the personality. And the end result is streamlined, not stark.